Forget being tied to your phone all day. Just invite your clients to book their own appointments using your personalized online booking page. It’s fast, convenient and available 24/7. 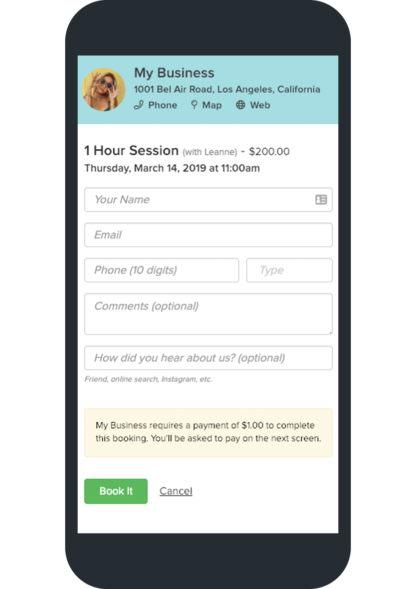 Let clients book appointments directly from your Facebook, Instagram, email, or your company website. Get to know your clients ahead of time by requesting specific information when they book their appointment. Show off your style and make a great first impression by customizing the look of your booking page. Help your clients stay organized and show up on time for their appointment. BookedIN’s friendly email and text message reminders are automatically sent to clients for every appointment. A friendly, perfectly-timed text message sent to your client’s mobile phone. Clients can reply to confirm their appointment automatically. Send an automatic email reminder to your clients. You can even include a custom message and a link for clients to confirm their appointment. Automatically collect payments or deposits when clients book appointments online. Reduce no-shows by asking clients to pay online when booking their appointment. Clients can pay via credit card or PayPal and the money gets automatically deposited to your account. Try all the features for the first 30 days! No obligations. No credit card required. The BookedIN mobile app is the best way for you and your staff to keep your finger on the pulse of your busy day. Get notifications, book and manage your appointments, quickly see activity, make adjustments, write notes, and watch for booking notifications. Sync your personal calendar so clients can only book when you’re actually available. Easily add your booking calendar or a “Book Now” button to your website or social media. Clients can find and book your services through online search. All appointments and client data is instantly saved and backed-up to our secure cloud server. Contact us any time! We’re here to help you get set up, or answer any questions. Invite your team and give them full or partial access to view calendars, book appointments or change settings.